Two Week Ampuversary (plus 1 day) 6 months post-op: Looking good! Just a quick update, but this morning Tia jumped up in the kitchen counter, LOL I think she has been getting up on counters for a few weeks now, but today I caught her in the act Pretty impressive since its only been 1 month since her surgery. So my kitty-free counter days were short, LOL It’s actually great to see her with all her bad habits returning. 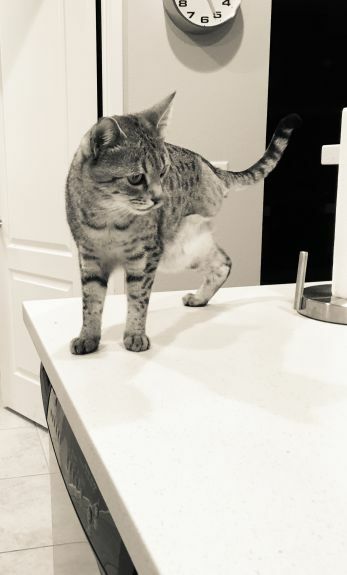 Tia kitty on a counter is a milestone worth celebrating! When our dog was counter surfing once again, we had never been so happy for “bad” behavior! She looks great – and is clearly feeling great. Happy to see this update. I just realized Id missed the previous post where Tia is playing! That is a great video!! It needs to be put in our Trilawds Video thread! Happy one month ampuversary! And don’t cats belong on counters? That’s what mine always say. Yeah Tia! Happy one month Ampuversary!